The Miami-based non-profit organization Community Arts and Culture, dedicated to presenting the arts as a tool for education, is planning their biggest festival event ever. 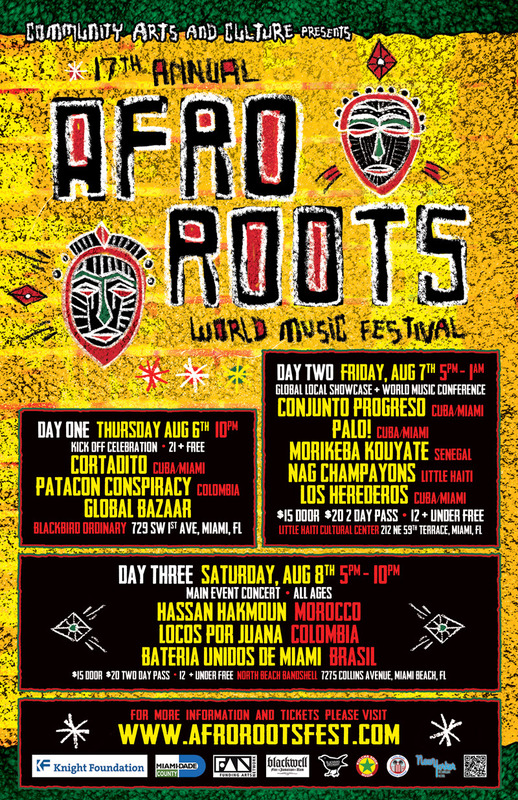 Taking place August 6 – 8, 2015, the 17th annual Afro Roots World Music Festival will launch with a kick-off celebration on Thursday, August 6th at Blackbird Ordinary , continue with a World Music Conference and Global Locals Showcase on Friday, August 7th at the Little Haiti Cultural Center , and wrap with a main event headliners concert on Saturday, August 8th at the North Beach Bandshell . Celebrating the evolution of African culture by featuring some of the best performers from all over the Caribbean, the Americas and Africa, the festival’s opening event will feature music by Cortadito (Cuba / Miami) and Patacon Conspiracy (Colombia) along with a global bazaar. Day two at the LHCC includes showcase performances by Conjunto Progreso (Cuba / Miami), PALO! (Cuba / Miami), Morikeba Kouyate (Senegal), the Nag Champayons (Little Haiti) and Los Herederos (Cuba / Miami), plus DJ Moses spinning global selections. Day three on Miami Beach will conclude the festival with headliners Hassan Hakmoun (Morocco), Locos Por Juana (Colombia) and Bateria Unidos de Miami (Brazil), along with DJ Le Spam. Day two’s World Music Conference and Global Locals Showcase is the festival’s most recent undertaking. The conference will feature three highly-informative panel discussions focusing on the business of world music; such as how to build an effective management, publishing and publicity team, what artists need to know about booking agents levitra professional and touring, and more. Speakers and panelists will include Dmitri Vietze (CEO / founder of Rock Paper Scissors, Inc.), Isabel Soffer (co-founder / co-director of Globalfest), Deirdre Valente (Lisa Booth Management), Cary Sullivan (producer, Airtel Music Express / booking agent, Afro Funke), Gustavo Fernandez (CEO, Delanuca Music Group, president, BVE 45), and Janice Bond (cultural curator | arts advocate). Workshops will focus on North and West African traditions and Afro-Cuban folklore. This year’s main festival headliner Hassan Hakmoun will present a lecture on the traditional sounds and culture of the Gnawa people of Marrakesh, and demonstrate his main instrument the sintir, a three-stringed lute with a body made of camel skin stretched over nutwood. Master percussionists Roman Diaz and Mauricio Herrera and multi-instrumentalist Onel Mulet will demonstrate the application of traditional Afro-Cuban based folkloric music in the context of modern or contemporary music. Senegalese percussionist Aly Mbaye and Morikeba Kouyate on the kora will show attendees the rhythms of the sabar drum and djembe, as related to the Mandingo musical traditions of Senegal, West Africa. Delou Africa Inc., a locally based non-profit organization that presents the annual African Diaspora Dance & Drum Festival of Florida, will be hosting a West African dance workshop with a live percussion ensemble. A special after-party will take place Saturday, August 8 at Naomi’s Garden Vibes Restaurant , beginning at 10 p.m. featuring DJ Lance – O and the Kulcha Shok crew. There will be a $5 cover charge and the event is open to those 21 and over. Day one is free and open to those 21 and over. $20 two-day passes for days two and three are available online at afrorootsfest17.bpt.me or admission is $15 at the door. A $10 discounted door rate is available for students and seniors with ID; kids 12 and under are free. Great news! I’m going to go.